Edith brings you a show to provoke and challenge those in the community who have a disability. The focus is on living out of ability, not disability. Hamilton has about 26,000 people with disabilities, and she interviews a wide range of them, their families their spouses, and those in the role of offering services and care. Life philosophies, motivations, self-developement are areas for investigating. Each week there is a notice board to keep listeners informed about the many seminars, courses, events, sports, training and projects available. Edith has a background in volunteer work with various city projects, and involvement in organisations run by disabled for disabled. With a disability herself, she is outspoken on behalf of her community. Edith is passionate about seeing those with disabilities recognised as having a vital input into our city. Talents, abilities and huge diversity are found in this sector of our community, and this show, Talking Up Disability, encourages even greater participation. 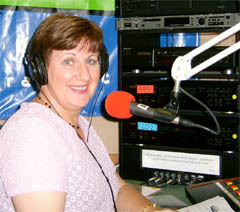 Your local voice on national and international disability issues. Administrators of the Wheeler/McIvor Trust.